I’ve never written a review before. But, there’s been many conflicting reviews on the internet such as Amazon and a few others about the difficulty of assembling the base. I’ve had no problems putting this together. However, the box did say “Improved Design”. Maybe that had something to do with it. It was quite simple, and the instructions were clear. The only reason I looked at the instructions was because some people were having such problems, that I was trying to figure out why. The only difficulty I can see would be bolting the two non-swivel casters in the brackets. There’s two bolts tucked away in the back that are hard to get at. I used a 1/4” drive ratchet, with a 13mm socket, a 3” extension, and a 13mm wrench as shown below. Because I needed both hands to do this, I used a wood clamp to hold the corner brackets upright. 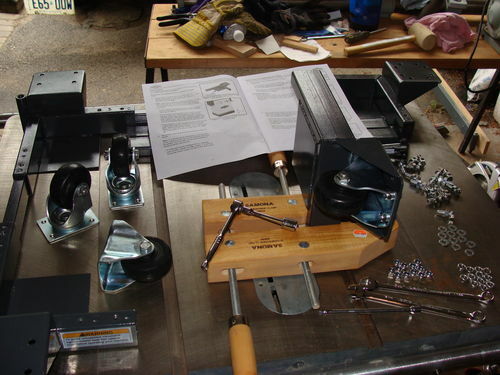 The picture below shows how I assembled everything together with a piece of 3/4” plywood keeping the saw off the floor so that there is no need for lifting after. I did cut 1” off two rails because I wanted the base to be snug. If I left it alone, there would be a 1/2” space along the front or back which would have been fine, but I’m picky. Moves around easily on the floor. You have to bend and screw down the legs. But, if you wanted a foot brake, you’re probably looking at double the price of this one. Also, the pins for the rubber feet could have been a little thicker in diameter. When you screw down the feet, the base can wobble a bit if you force it. 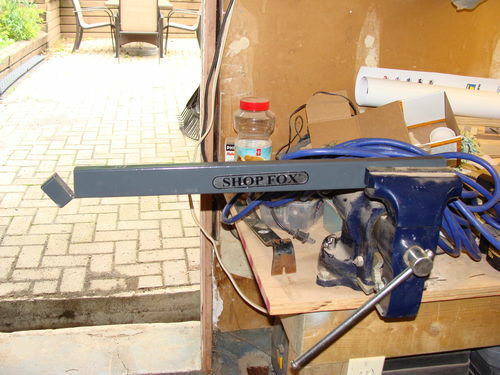 Having said this, I would recommend the Shop Fox D2057A mobile base and I give it 4 1/2 stars. Beef up the foot pins, then it would get a 5 star rating. Since I want a foot brake, what would double the price be? Maybe I’m being snotty, but if cost is an issue, either good or bad, why not mention the price and where purchased? I didn’t mention price because I’m in Canada, and it’s probably different in the States. I paid $89.99 at Busy Bee for mine. They did have an HTC 3000 for $20 more, but the foot brakes I didn’t find were really all that good. There was another one there as well, same thing. I was comparing this to the Delta mobile base. Around here it’s almost double in price. But, it’s really good quality. If you look online, you can get it for $130 – $140. Maybe cheaper if you look hard enough. This is why I didn’t dwell on price in my review, because it can be all over the place. You have to remember when ordering online, you have to pay for shipping. And that could be costly. I hate bending over for anything….might have something to do with this growing girth. However, I think what I’d do is, use a hacksaw to cut off your lift screw about midway between the handle and where it enters the frame. 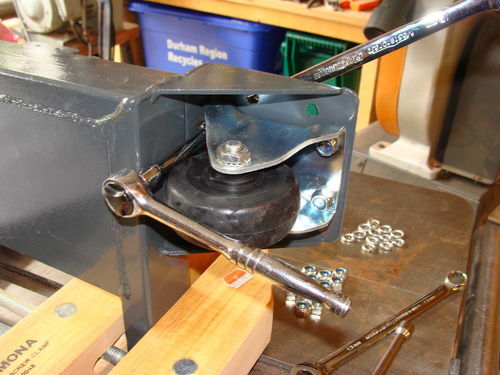 Get some all-thread (length of rod that’s got the same screw thread as the original lift screws) and a couple of threaded couplers (like what they join lamp sections together), and some epoxy and just lengthen the screw stem to just under the saw’s table. You could also put some L-brackets up near the new handle height for stablity when screwing them down. No more bending over, no more plumbers crack. Thanks for the review. It looks well made. Thanks for the review and the info on pricing. It helps to prevent “sticker shock” even if it is Canadian. bubinga—I have one of these under my bandsaw … I never measured it, but I would guess it only raises the machine by about an inch. Ruintuit – I think you should patent that. It’s actually not a bad idea. Redryder – I’m with you. For as often as I’m going to move this, I don’t mind bending now and then. Bubinga – It raised the saw 3/4” higher. You’re right, I couldn’t find anything about that either when I was deciding on buying this base. That sure is a good lookin saw !! Bertha’s band saw would look good setting next to it. I’m surprised I couldn’t find any info on height. That was very important because my saw was 34” high, and my flip top outfeed table was 34 1/2” high. 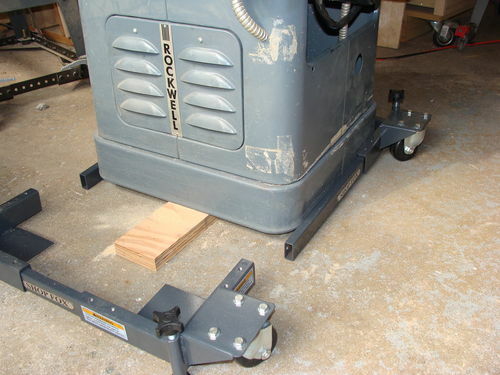 It wasn’t until I went to Busy Bee Tools that I was able to measure the floor model that they had assembled. I havve the same mobile base for my General TS. I agree it seems to be really well put together, the instructions were strtaight forward. I like your idea of the plywood to set the height. That would have been easier than the rocking back and forth I did as I assembled the base. I like that the offer two ways to put it together; one assemble it first and then put the machine on it the other to build it around the machine like you (and I) did. Good review. I’m glad to see this review. I like this one because it has metal channel that comes with it instead of the many others that are wheeled corners only and require the owner to supply wood (or metal, I guess). I am having some difficulty with assembly. I have never been accused of being the most mechanically inclined. So here goes. How are the measuring the Hex bolts? 1.25×25 and 1.25×16. Is 1.25 the TOTAL lenght of the bolt? Also 16 vs. 25? is this thread per inch? I sure can not tell any differnce in thread size? Also, how does the lock nut and bolt assembly work to join the rails? Why didn’t they just drill through both rails and use a lock nut or usual assembly to join the two rails? I can figure out how this is supposed to work? Help?